The Supreme Court, in Fazar Ali vs State of Assam, held that there is no inconsistency in chargesheeting and convicting persons who have not been named along with the other accused in the First Information Report. Speedy recovery proceedings, need of the day. The Supreme Court, in Ananth Singh vs State of Bihar, held that a second detention order under the Bihar Control of Crimes Act, 1981, can only be passed on fresh grounds that arise after the order of revocation. The law in force on the date at which a formal, final decision is taken by the competent authority, alone would be applicable to consider grant of foreign liquor licence, the Supreme Court held in State of Kerala vs M/s Palakkad Heritage Hotels. The Supreme Court, in Sudha Renukaiah vs State Of AP, held when there are eyewitnesses, including injured witness who fully support the prosecution case and proved the roles of different accused, prosecution case cannot be negated only on the ground that it was a case of group rivalry. The Supreme Court in Manti Devi vs. Kishun Sah, held that no decree can be reversed or substantially varied in appeal or revision on account of misjoinder or non-joinder of parties. Setting aside a judgment of Bombay High Court which had held that it is not necessary for a ‘defendant’ to first admit the ownership of the ‘plaintiff’ before raising a plea of adverse possession, the Supreme Court, in Dagadabai vs Abbas, held that a person claiming adverse possession must necessarily first admit the ownership of the true owner over the property to the knowledge of the true owner. The Supreme Court, in Indus Mobile Distribution Private Limited vs Datawind Innovations Private Limited, held that when there is an exclusive jurisdiction clause in an arbitration agreement stating that the courts at a particular place alone would have jurisdiction in respect of disputes arising under the agreement, it would oust all other courts’ jurisdiction in the matter, even in a case where no part of cause of action arises at that place. The Supreme Court, in the case of Mahendra Singh Dhoni vs Yerraguntla Shyamsundar, held that not every act or attempt to insult religion or the religious beliefs of a class of citizens would be penalised under Section 295-A of the Indian Penal Code. Court cannot be expected to surrender its own judgment and delegate its authority to a third person, however great, the Supreme Court, in Machindra vs Sajjan Galpha Rankhamb, observed while upholding a high court order which has set aside conviction of accused in a murder case. Death Of Buddhist Lama In Police Firing: Notice To Arunachal Pradesh Govt. The Supreme Court sought response from Arunachal Pradesh government on a petition for an independent inquiry into two deaths, including that of a Buddhist Lama of Tawang Monastery,and several persons being seriously injured in the alleged police firing in May last year. In a blow to Singareni Collieries Company Limited (SCCL) employees, the Supreme Court upheld the Andhra Pradesh High Court judgment which had quashed ‘hereditary jobs’ scheme for SCCL employees. The Supreme Court, in Union of India vs M/S Simplex Infrastructures, reiterated that intra-court Letters Patent Appeal under clause 15 of the Letters Patent of High Court at Calcutta is not maintainable against an order passed by the single judge on an application for condonation of delay filed along with the petition for setting aside an arbitration award. Delivering a significant verdict with massive political ramifications, the Supreme Court on Wednesday restored criminal conspiracy charges against senior BJP leaders L K Advani, Union Minister Uma Bharti, Murli Manohar Joshi and 13 other leaders in the 1992 Babri Masjid demolition case. The Supreme Court, in a brief order, observed that an FIR can be quashed in part against some accused against whom no cognizable offence is made out. The apex court bench comprising Justice Pinaki Chandra Ghose and Justice RF Nariman, in Lovely Salhotra vs State, set aside a Delhi High Court order and observed that the court could not refuse to quash FIR only on the ground that the investigation against co-accused is still pending. The Supreme Court, in Kalyan Dey Chowdhury vs Rita Dey Chowdhury,upheld a Calcutta High Court observation, which by relying on a judgment of the apex court, had held that 25 per cent of the husband’s net salary would be just and proper to be awarded as maintenance to the wife. The Supreme Court on Friday disposed off petitions which sought direction to the Centre to bring back the Kohinoor diamond from UK saying the court cannot do much in this issue and the government was anyways taking diplomatic measures get it back. Giving a stern message to a hotel owner who misused ‘stay orders’ of the courts to make ‘personal gains’, the Supreme Court ordered him to deposit an amount of Rs. 2,40,90,000 with Panaji Corporation, as reimbursement of profits earned by him for using unauthorizedly constructed hotel rooms for the past 11 years to his benefit. The Supreme Court quashed criminal defamation case against BV Seetharam, the proprietor of newspaper Karavali Ale. The Karnataka High Court had refused to quash the criminal proceedings filed by Bojaraja Shetty against Seetharam, even after the declaration filed under Section 5/7 of the Press & Registration of Books Act, 1867, was produced before the court. In a setback to Tata Group, the Supreme Court rejected its plea seeking lease renewal of Taj Mansingh Hotel in New Delhi and allowed civic agency NDMC to e-auction the property. 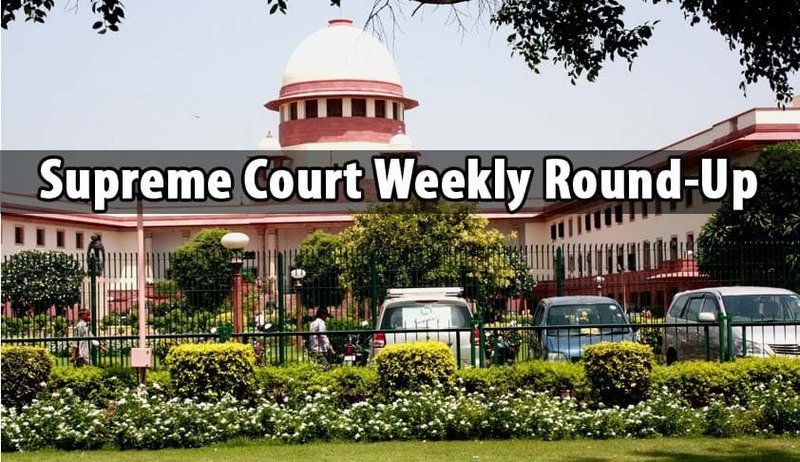 The Supreme Court imposed a fine of Rs one lakh on the Centre for not coming out with the agreed directions to improve the condition of destitute widows and granted it four weeks to do so. The Supreme Court, in State of Bihar vs Anil Kumar, upheld a notification issued by the Bihar Government, authorising all the officers of the rank of police inspector, sub-inspector of police and assistant sub-inspector of police to investigate cases filed under the Scheduled Castes and the Scheduled Tribes (Prevention of Atrocities) Act, 1989, within the state of Bihar. Going strictly by its tough words on March 21, the Supreme Court in a stinging order on Monday directed auction of Ambay valley property of Subrata Roy’s Sahara Group as it failed to deposit the amount which was to deposited by today for repaying investors. In a relief to star cricketer Mahendra Siingh Dhoni, the Supreme Court on Thursday quashed a criminal complaint lodged against him in an Andhra Pradesh trial court for allegedly hurting religious sentiments by depicting himself as Lord Vishnu on a magazine cover. The Supreme Court set aside a Rajasthan High Court judgment which did not set out even the factual controversy nor dealt with the submissions urged by the parties before it and nor examined the issues in the context of relevant provisions of the Act that governed the controversy. In a huge setback to BCCI President N Srinivasan, the Supreme Court on Monday ruled that he cannot represent the Board at the ICC meeting next week as he had been earlier held guilty of conflict of interest. The Supreme Court had to recently set aside a judgment passed by the Himachal Pradesh High Court, because of the convoluted English used in the judgment. The Supreme Court’s Five-Judge Constitution Bench on Tuesday began hearing the challenge to WhatsApp’s ‘data-sharing’ policy, amidst reservations expressed by the Attorney-General and WhatsApp, about the nature and scope of the hearing itself. The Supreme Court on Tuesday extended the exemption granted to certain categories of disabled persons from standing while national anthem is played in cinema halls to those affected with autism, cerebral palsy, multiple disabilities, Parkinson disease, stenosis, leprosy and polio cured. The Chief Justice of India J S Khehar’s bench directed six states-Bihar, Jharkhand, Uttar Pradesh, Tamil Nadu, Karnataka and West Bengal to place record the road maps to fill up the large number of vacancies for police posts in their respective states. The Kerala Water Authority has been given two months time by the Supreme Court to clean up the pond of the historic Sree Padmanabhaswamy temple in Kerala. The bench led by Justice A K Sikri has decided to examine on Wednesday the petition challenging Section 139AA of Income Tax Act whether Aadhaar can be mandatory for filing I-T returns. The Supreme Court indicated to refer to a five-judge constitution bench whether a minister can claim under the right to free speech to speak contrary to the Central government’s statute and policy. The Supreme Court on Monday issued notice on a petition seeking transfer of a matter pending before the Chhattisgarh High Courts in which it was sought for court-monitored investigation in instances of extra-judicial killings in the State . The Supreme Court asked Centre to obtain instructions on whether a separate SIT can be set up for investigation in a matter relating to investigation in panama papers. Supreme Court of India on Monday issued notice to High Court of Kerala on a petition challenging the selection process to Kerala Higher Judicial Service (District & Sessions Judges).